In this CELL students investigate and model physical and chemical weathering. Additionally, students model erosion and the extent to which erosion can affect soil on a slope. In concluding this CELL, the students study various components of a model soil sample and investigate the size differences among the three components. Recognize and investigate the differences between both physical and chemical weathering. Model physical weathering and investigate chemical weathering of marble. Model erosion of soil by water on a sloped surface. Determine factors that increase and decrease erosion of soil. 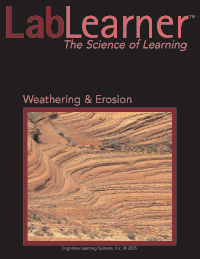 Correlate the extent of soil erosion with differences in the slope of a surface. Investigate the different components of a modeled soil sample and determine the differences between the components.